The Delhi Capitals are coming off a heavy defeat against the Kings XI Punjab where they collapsed from 144/3 to 152/10 and lost the game. Their confidence will be dented after that match and they should find a way to get over that and come back positively. The Sunrisers Hyderabad on the other hand are coming off a huge win against the Royal Challengers Bangalore. They will be really happy about the way Warner and Bairstow have gone about things, getting 3 consecutive 100 runs partnerships. It will be interesting to see how their middle order plays if the openers fail to deliver. Out of the 12 matches played between the two teams, The Sunrisers Hyderabad have dominated with 8 wins under their belt. At Delhi, the trend continues as the Sunrisers have won 3 out of the four games played. Shikhar Dhawan, for the Delhi Capitals, has not managed to play a match winning innings in spite of getting starts. As a senior batsman in the team, he should look to take the responsibility of batting till the end and taking the team through. Coming up against his old team, he will be looking to get a big score against them. Rashid Khan, for the Sunrisers Hyderabad, will play a key role in this game considering the pitch will might him. He has been a consistent performer irrespective of the conditions, and against batman who will try to take him on, he can be dangerous. The Delhi Capitals will look at getting Amit Mishra or Axar Patel or both back into the team considering the nature of the pitch at Delhi. The Sunrisers Hyderabad will not be looking at changes as Kane Williamson might not be available for this fixture. The Delhi pitch is expected to be a slow and low wicket. The game against Knight Riders turned out to be high scoring, but in general, it is expected to be a pitch that is tough to bat on. 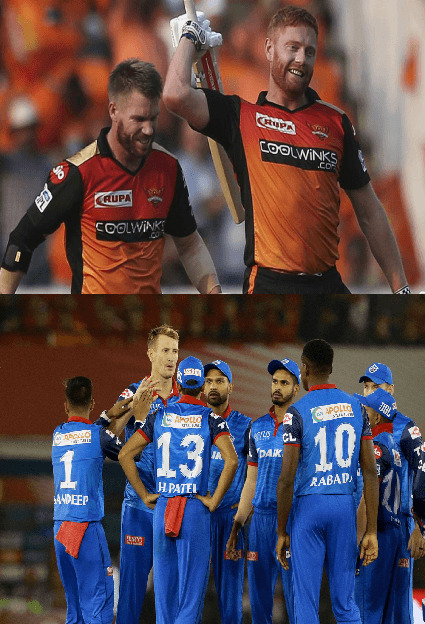 The Sunrisers Hyderabad will start as favorites considering their previous record and current form. The inexperienced and thin batting line up of the Delhi Capitals has been found out in the last two games, and hence teams will know they that a few quick wickets can push the Capitals back. The pitch at Delhi will also not suit the home side which is packed with young and flamboyant batsman who like the ball coming on to the bat and a bowling attack filled with quality pace bowlers. The Spinners will be key for both teams. The Sunrisers Hyderabad should look at using the likes of Rashid Khan and Mohammad Nabi early on in the innings on the slow pitch against the Delhi Capitals batsman who like the ball coming on to their bats. The Delhi Capitals on the other hand should look to using Sandeep Lamichhane and Axar Patel if he plays, early on against Warner and Bairstow. They will know that Warner and Bairstow will not enjoy the slow nature of the pitch at Delhi and hence should try and take the pace off the ball against the two, which will help them expose the untested middle order of the Sunrisers Hyderabad.